Lucio Fernández and his wife (and frequent collaborator) Megan Fernández are happy to announce their newest co-production– their son Ryan Lucio Fernández, shown at right. 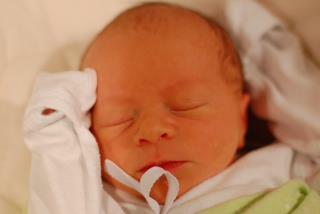 He was born on January 29, 2013, weighing 6 lbs. 10 oz. and coming in at 19 inches long. Mother, father and son are doing just fine [Blogger's note: Congratulations!!]. Sarah Nina Hayon is currently treading the boards in the world premiere of the Octavio Solís play Se llama Cristina. Directed by Loretta Greco, the play is running in January and February at the Magic Theatre, located in San Francisco, California. For more information, click here. Laura Riveros is acting in Haydn Díaz's play When Worlds Collide (Cuando mundos topan). Directed by Tamara Winters, the play will be presented in February as part of an event by NYMadness at the Cherry Lane Theater in Manhattan's West Village. For more information, click here. Otro Teatro is presenting the César Brie play Frágil. Directed by Billy Martín Mejía, the production stars Mejía, Angie Regina, Miguel Maldonado and Sandy Hernández and will enjoy a run in March at the Comisionado Dominicano de Cultura en los Estados Unidos in upper Manhattan's Washington Heights neighborhood.